â€œGive a man a fish and you feed him for a day. Teach a man to fish and you feed him for a lifetimeâ€. In a semi-arid climate there are only some types of agriculture that will succeed regardless of how much money you invest into it and when poverty is brought into the equation this list gets even shorter. However, in Kenya they have found a solution to this problem – bees and honey. Traditionally, beekeeping in Kenya was seen as a manâ€™s job. Beehives were typically placed high in trees meaning that it was a long and dangerous climb to the top to check on the hives. Culturally, this was not considered an activity fit for Kenyan women. 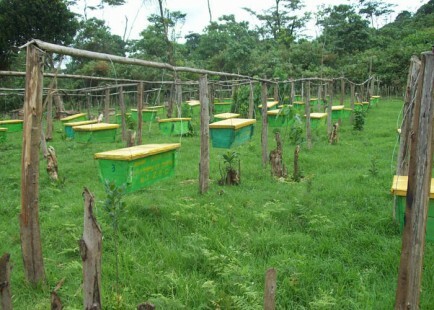 However with modern technology beehives can now be managed from the ground and the number of female beekeepers in Kenya is climbing. The growth in beehives has also been fuelled further by Honey Care Africa who launched the â€˜Money for Honeyâ€™ initiative. They provide farms in rural areas with the training, services and market access needed to become commercial honey producers. Honey Care Africa were founded in Kenya in 2000 and are now a member of the World Fair Trade Organization who guarantee a competitive fixed price for honey on a contract basis to provide a solid profit back to the farmer. Through their alliance with Kiva they are also able to help organise small loans which are then paid back through deductions from the contracted sales. This is the true definition of giving people the tools that they need to thrive in life. While it would have been easier to sub-contract current beehive keepers as suppliers, Honey Care Africa have increased skillsets of rural farmers by involving them in all aspects of honey making process. Furthermore, by providing the necessary equipment they have opened this field up to women as well as men along with providing a system where honey is collected and paid for on the spot which in turn provides the local economy a much needed boost.